There are no messages on FowWorld's profile yet. FowWorld is a global Finance, Projects, Logistics, Programmes, Transportation, Promotions, Investment, Productions & Real Estate Development Company. With a humanitarian arm GLOBAL FAMILY FUNDS. The company was founded in 1999. FowWorld is a fast growing organistion, positively imparting different sectors of the world. 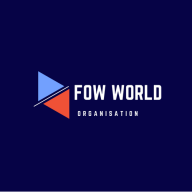 FowWorld organistion serves as one of the major employers of labour globally, satisfying the financial, intellectual and welfare needs of its vast, multi-talented and professional employees.